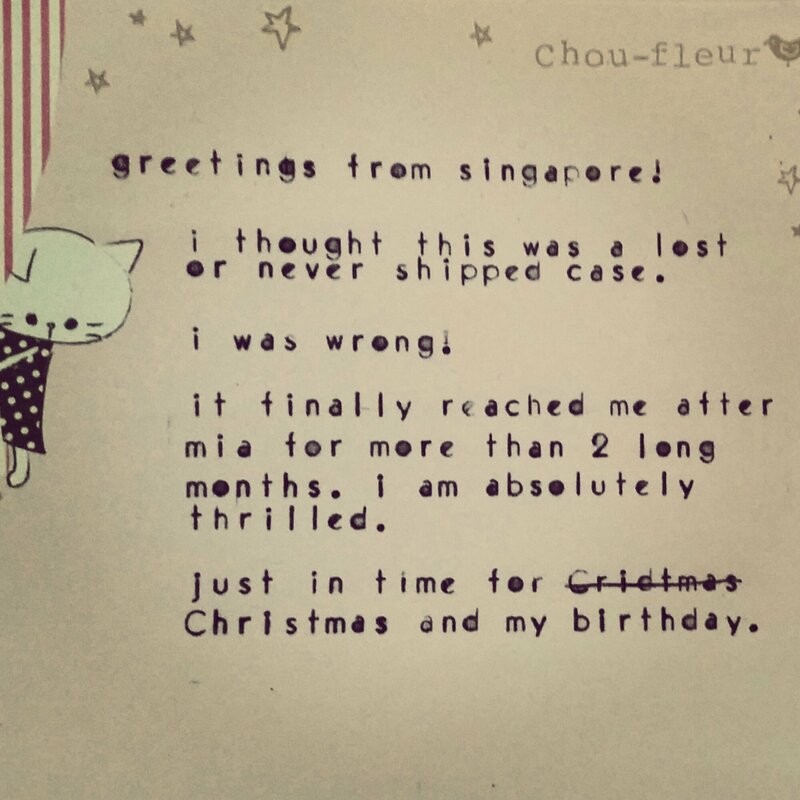 aitype from singapore | all about typewriters clakety clack clack! helllooo! it’s been a long, long …pause. hmm…where do i start? 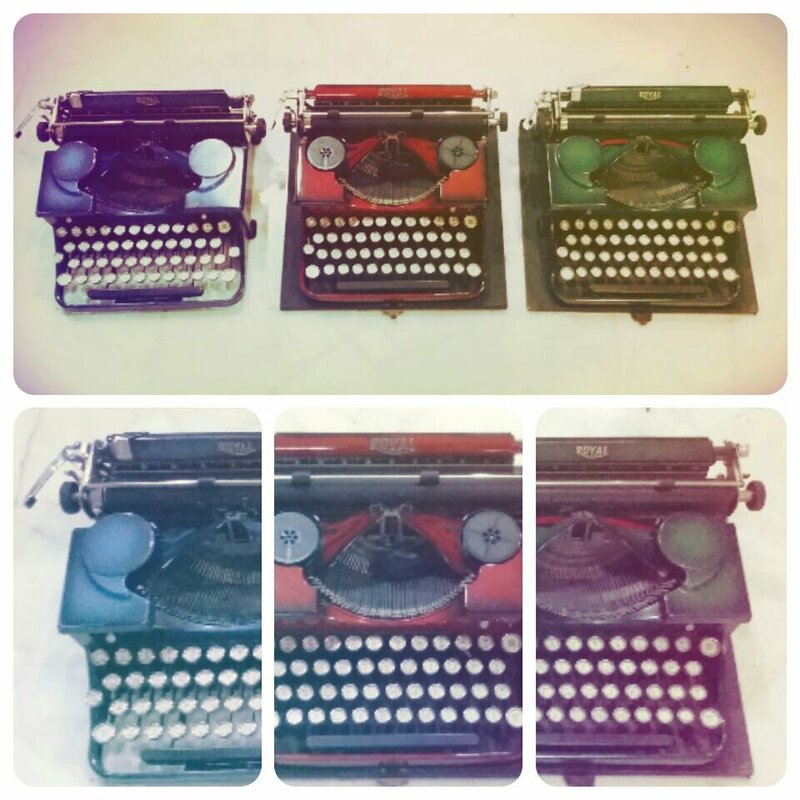 out of sight but still am an avid typewriter fan/collector /hoarder. the last time i checked, i still have about 30 typewriters, not considered many compared to the peak of my obsession phase. I’ve sold a couple and given a few as gifts. there are still a few pending tlc to clean and in need of a mini makeover. 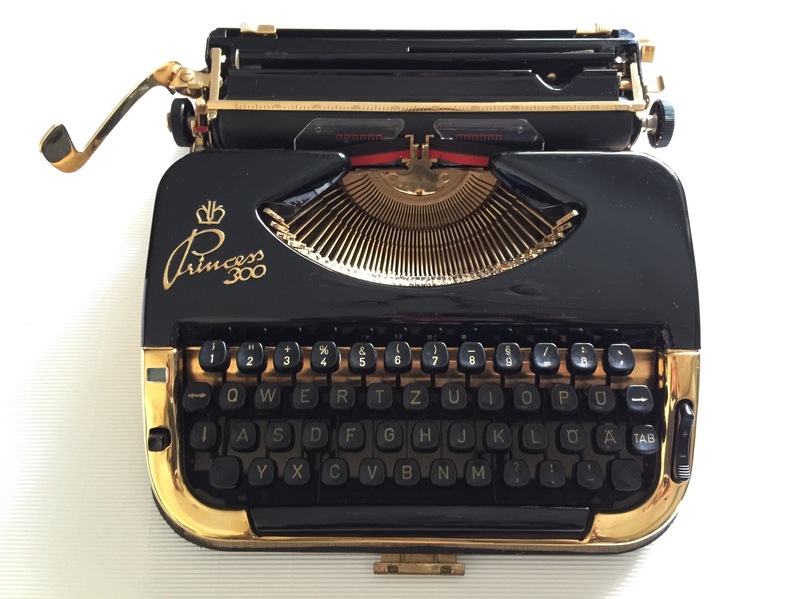 i’ve been more selective in buying typewriters in 2014.
here is my pride and joy – a golden princess for my princess (when she is old enough to appreciate it). meanwhile, this mommy will safe keep for her. i have not type any letters the whole of 2014 😦 . I’ve used my favorite typers mostly for arts and crafts. 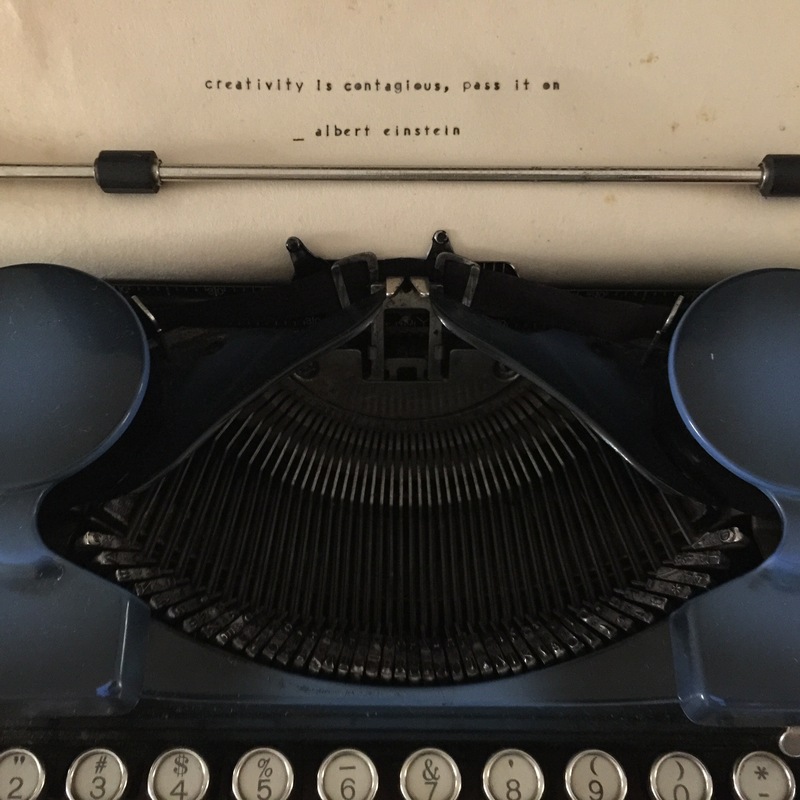 please share how you used your typewriter/s. bye bye 2013. hello 2014! It’s been another long hiatus … heart and mind willing to blog but fingers not. This time last year I found a techno yellow tippa. This year, a lost vogue blue royal p found me, a perfect wrap for 2013! Eye therapy… after the retail therapy. Haha. 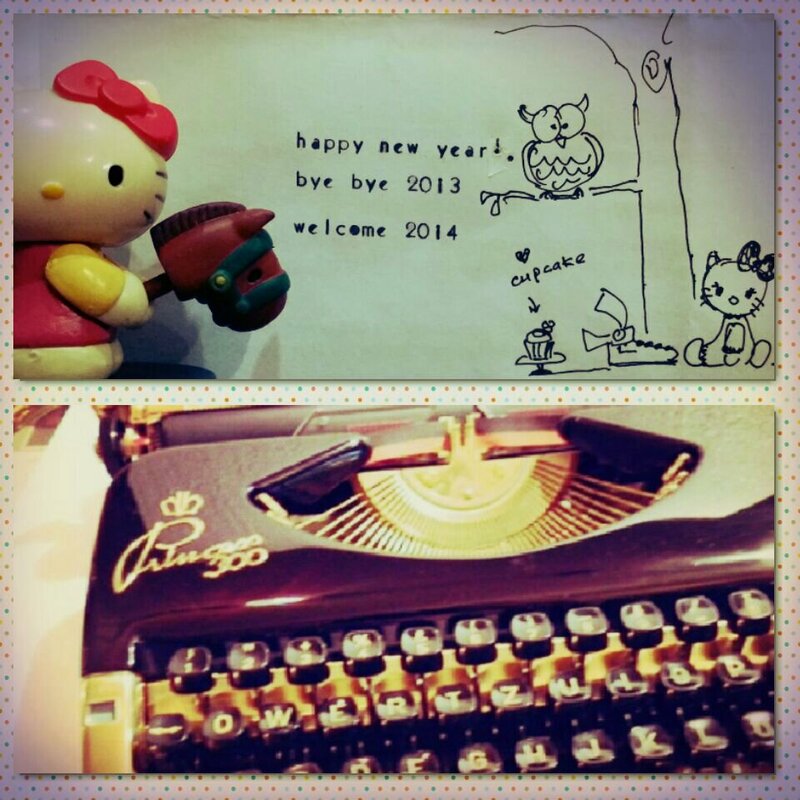 2013 ‘me’ time – chiffon cakes, owls, hello kitty, typewriter and more typewriters! Here’s wishing all a very, very, very…happy and blessed 2014 and more? 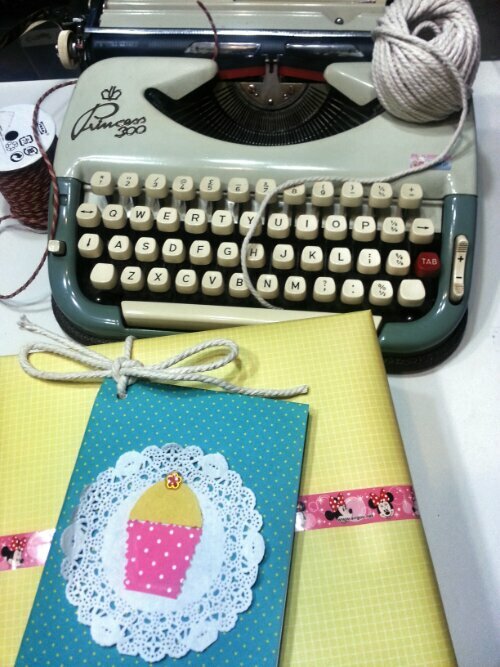 Gorgeous typewriters of course. triumph gabrielle 35 – plain standard plastic body and keys but what do we have here? a set of fraktur type slugs??!!! 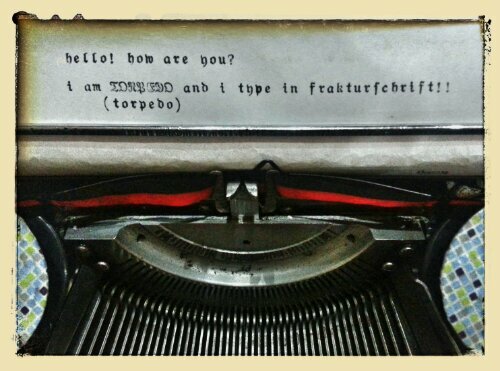 to be honest, it was difficult for me to type on torpedo 15a. it has the ornate fraktur letters printed on its glass keys. i cant be sure of what I was typing. this one, no such problem! 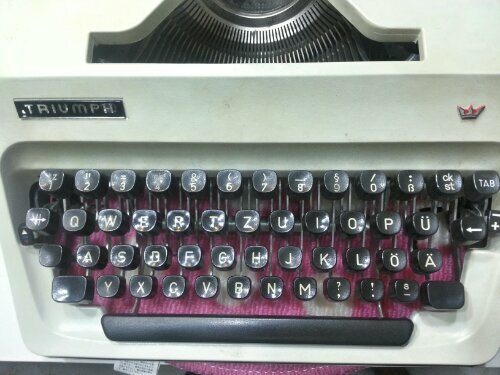 however, it is still a challenge to type the standard letter ‘s’ which is on the bottom right (1st row) of the keys. the long ‘s’ is at the ‘asdf’ keys. 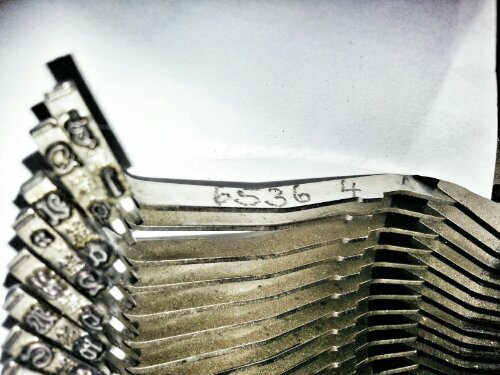 not sure if this is the typewriter, or type slugs serial number. do you know? 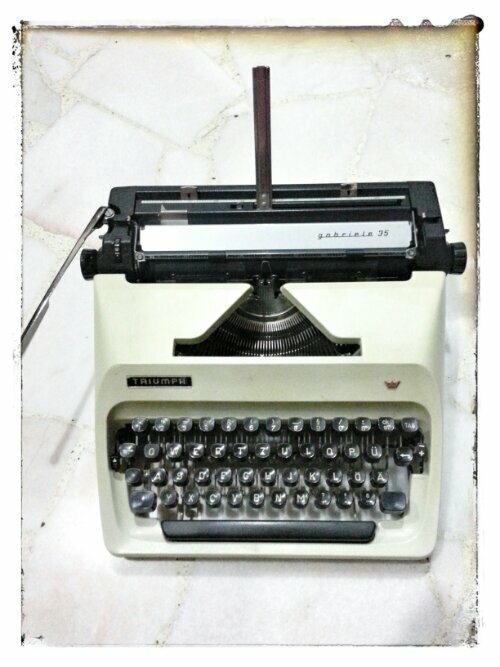 I tried looking for other serial number on the typewriter’s body but found none. 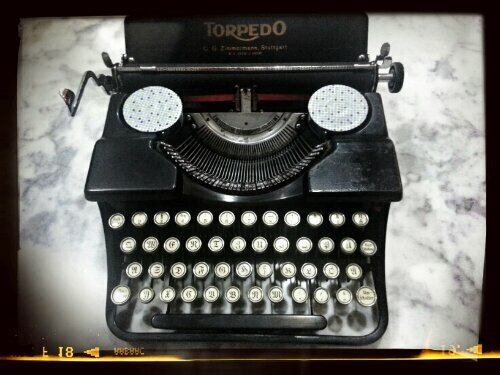 I am starting to think that I focused too much on getting THAT ONE, and more typewriters that I forgotten the reasons why I wanted them in the first place. 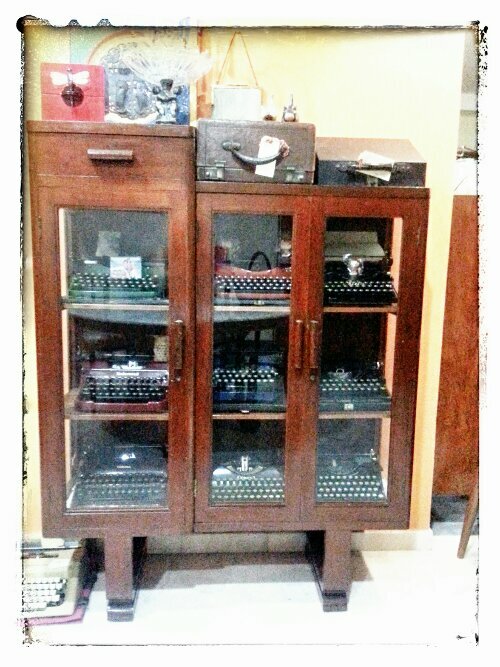 most of the times the typewriters are just sitting prettily in the display cabinets. I have typed less than 10 letters, procrastinated cleaning the dirty ones, few art and crafts projects and that’s about it. surely I can do better! 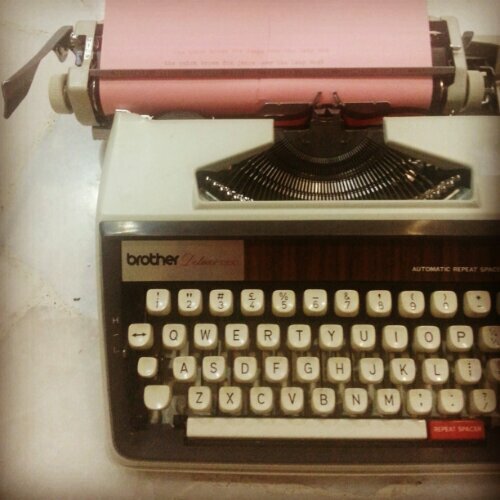 first thing first, I have decided to place one typewriter at my sister’s tuition center for the kids to play with (thank you Richard for the suggestion). 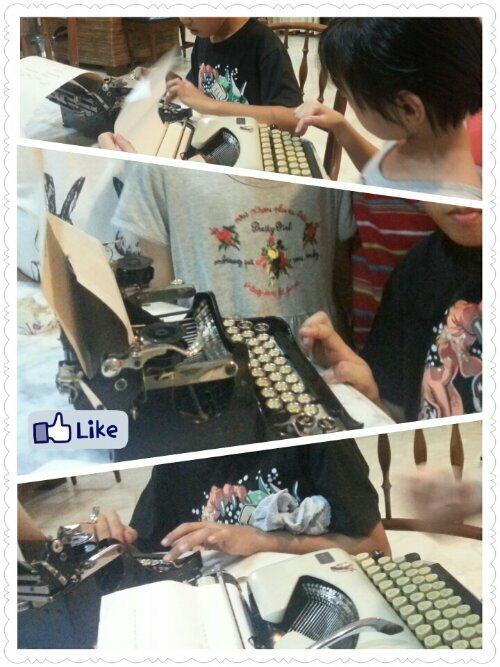 kids should know what is a typewriter and how one looks like. 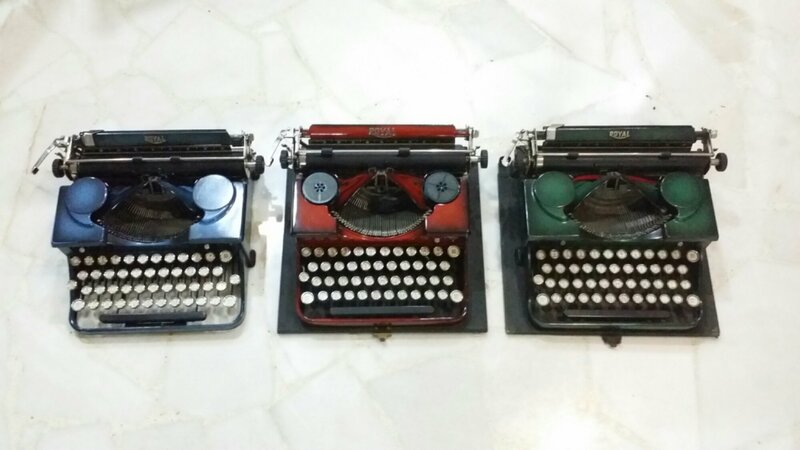 I have rehomed or sold typewriters to mostly young working adults except this once, I sold one to 3 young teens – 2 girls and a young man probably 13-14 years old. 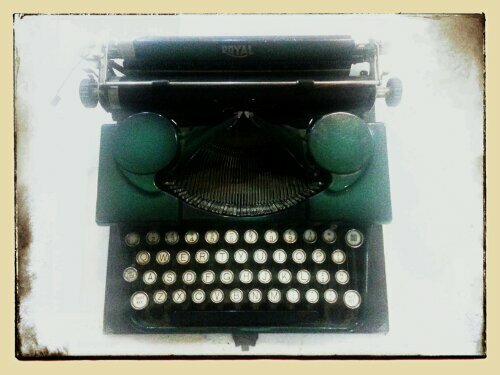 they came to me and queried about a typewriter I was selling via local classifieds. 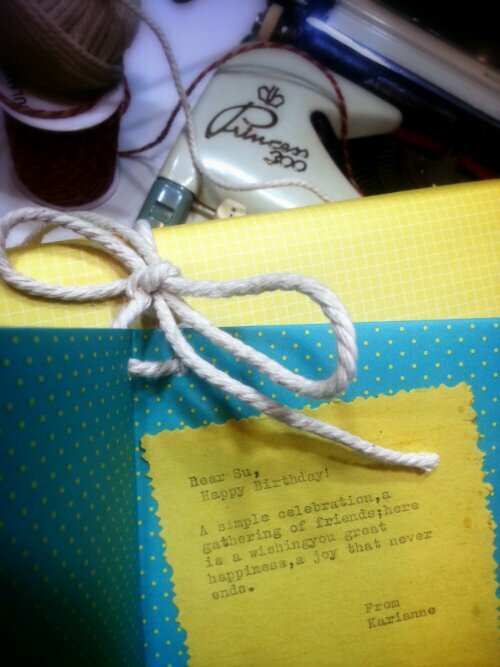 it’s heartwarming to hear that they chipped in money and buying it as a birthday gift to a vintage loving friend. oh so sweet of them. 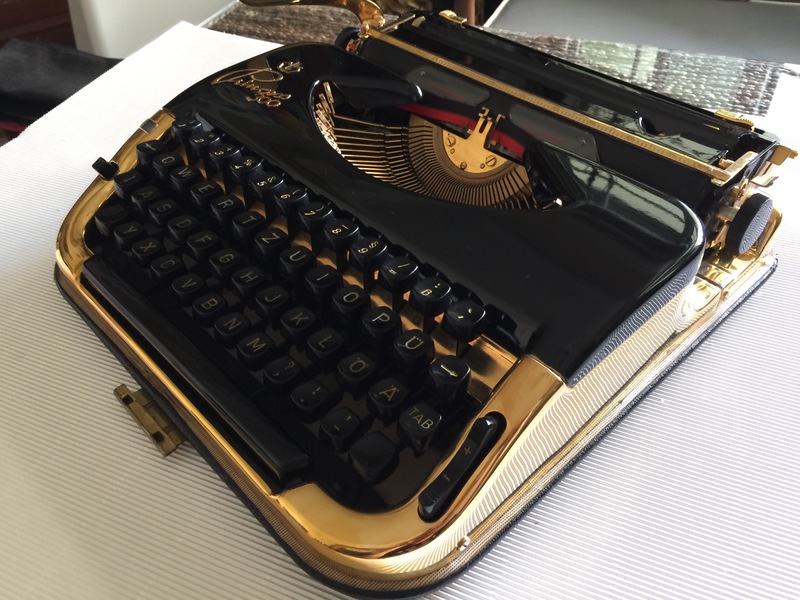 prior to this meeting, they had not seen and touch a real typewriter, and asked if I could do a short show and tell, ie. how to operate the typewriter. of course I promptly, happily did. they were almost too scared to touch it with wows and ahs! i felt guilty taking their money. 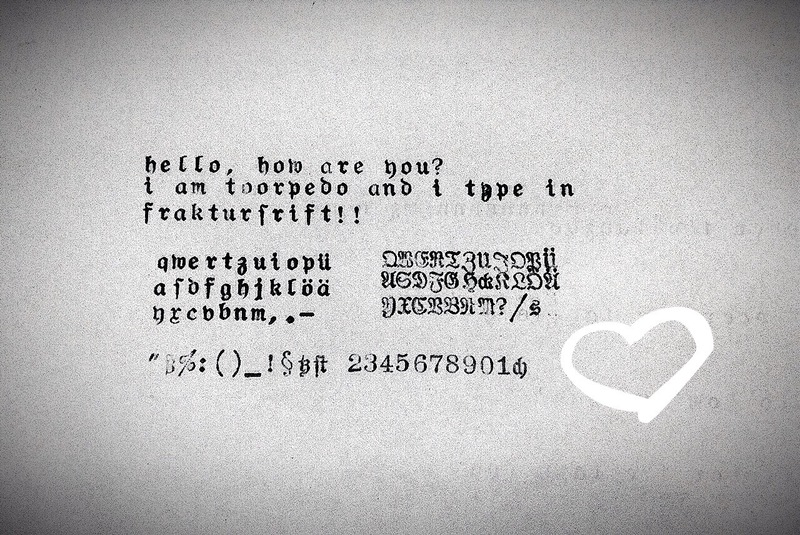 hmm… maybe it is time to think about how to spread some typewriter love to the young ones. any suggestions? 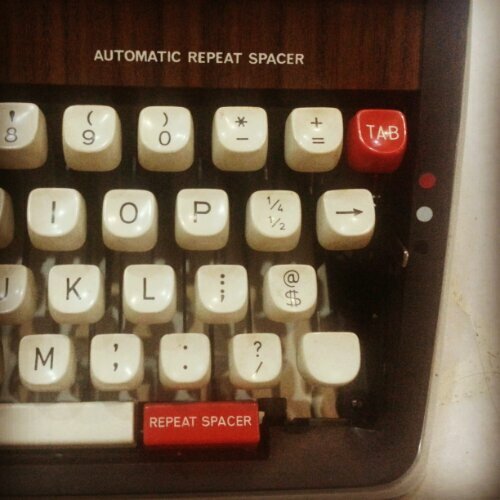 they bought this lovely woody brother typewriter that comes with special repeat spacer key. one of them exclaimed “oh! it has a case too? !” and didn’t mind at all when i told her the zipper is broken. me: oh these are typewriters. hearing this, his sisters came and look at the typewriters too. more happy stories coming. have a great weekend! 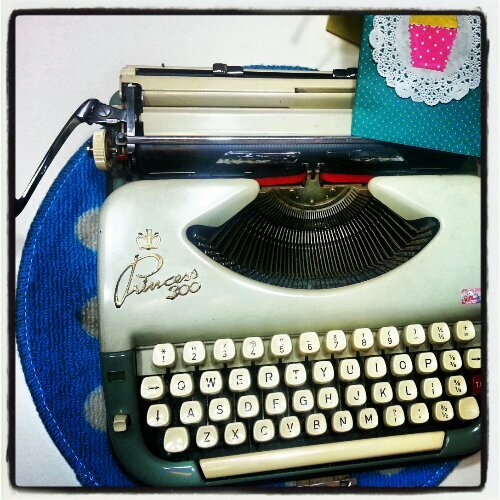 she was initially writing, typing her daily journal with it for a while. later, it was just collecting dust in her room so I moved it into the display cabinet. out of touch, out of mind. 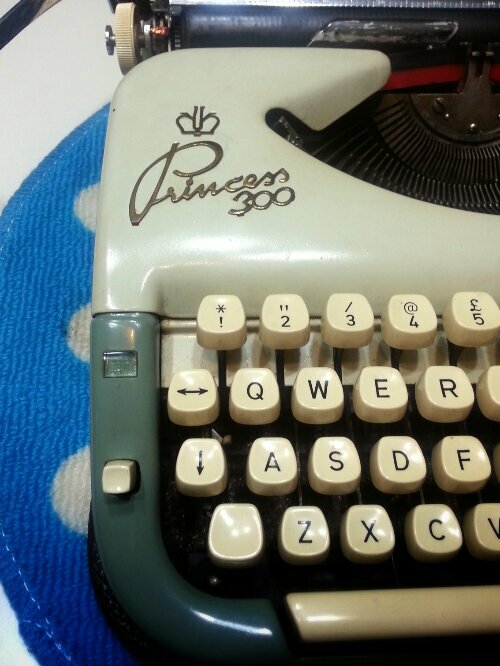 the princess typewriter has been sitting there prettily, quietly, unused until today. K is attending a birthday party and needed a birthday card. 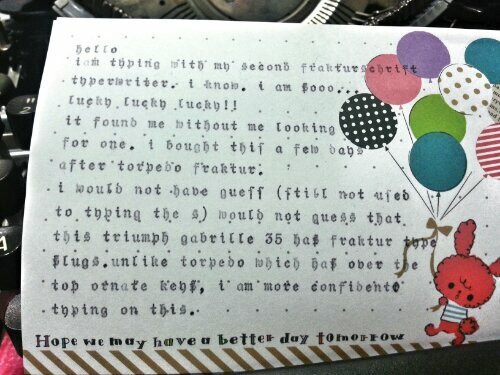 this typewriter came to the rescue and we made a personalized birthday card! I have gotten a few more typewriters since my last post (which was not too long ago!). I will reveal them in the coming posts. 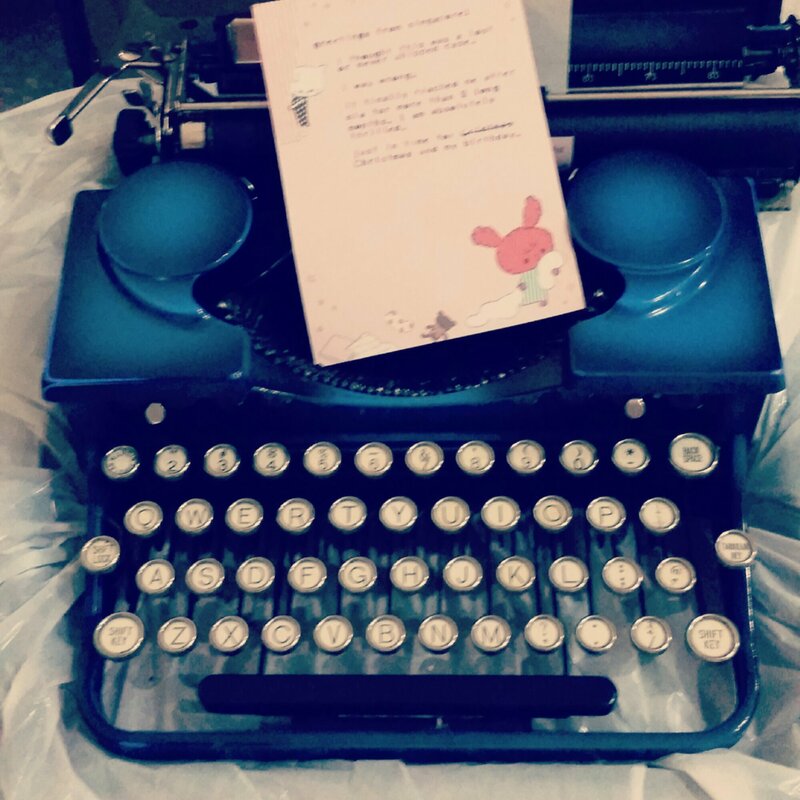 meanwhile, I am going cold turkey and will not be getting anymore typewriters, unless….well, there is always an exception. What is the hype about this ‘f’ word? no. the ‘f’ here is not that 4-letter word. 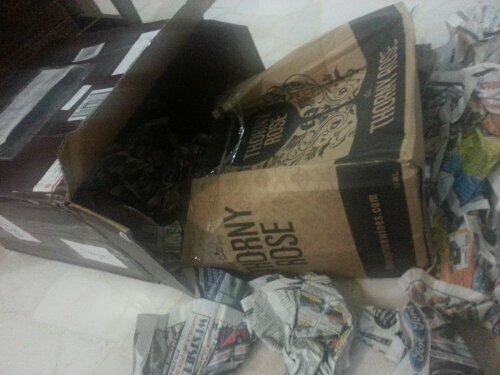 my other ‘techie’ half gave me that usual ‘look’ again when he saw the parcel. 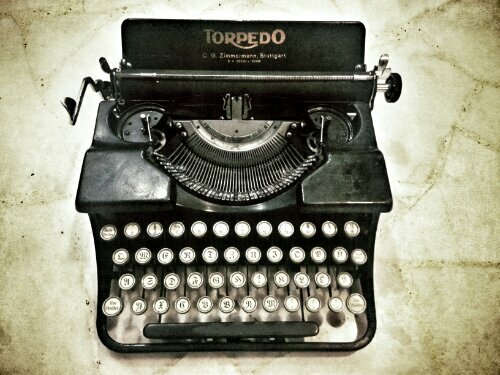 he doesnt understand why typewriters when one can type on tablets, smart phones, laptops, pc…. 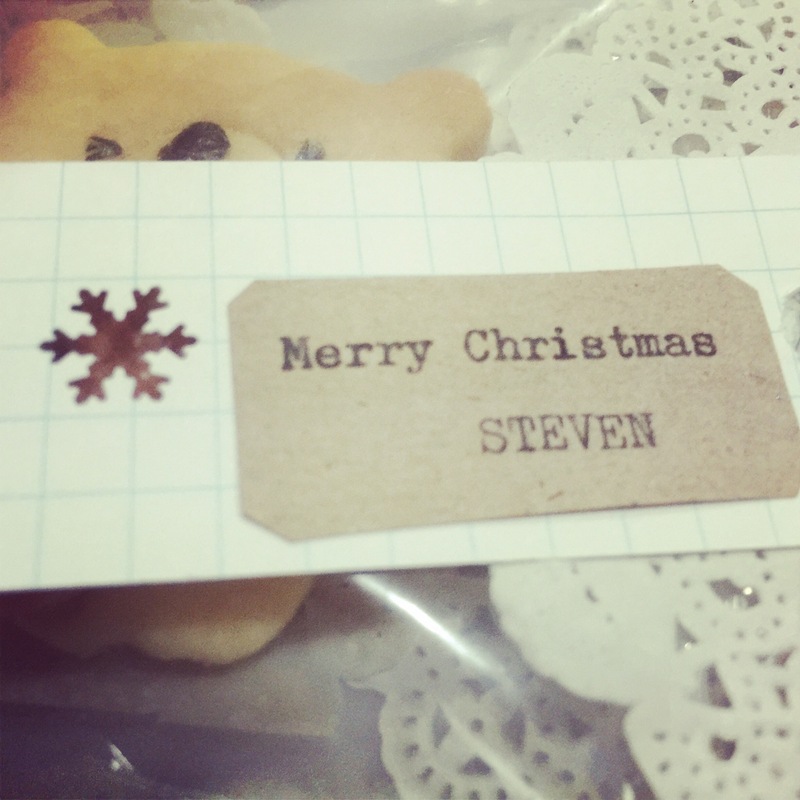 but he gave this a second look and a ‘hmmm..’ …. when he saw the type sample. yes, this is special. the typeface reminds me of calligraphy. beautiful keys. it is always a bonus when they are clean and not stained. i love the small letters but have a hard time reading the ott – over the top, ornate cap ones. did you notice that the small letter ‘s’ looks like ‘f’? it is called the ‘long s’ and evolved from the old roman form. this Wiki link explains. 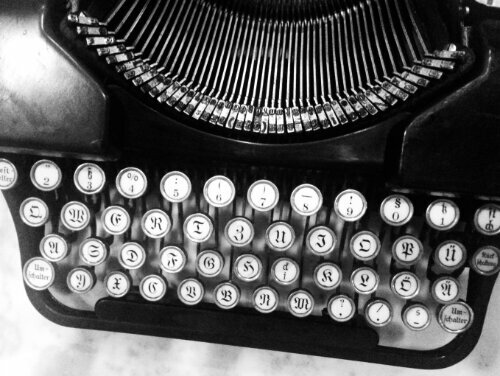 interesting, but i have seen other fraktur typewriters with the normal ‘s’. it didnt come with original ribbon spools and i dont want the look of normal plastic ones on this old beauty. i thought white or red painted spools would be an awesome accessories, and even toyed with the idea of putting hello kitty stickers. (hey, pls dont judge me! lol). one more typeface to check… i will wait. madonna sings – strike a pose! the art deco typeface so coveted by some typospherians, me included. i finally found one after 1.5 years of tirelessly looking and asking royal p sellers after sellers to provide typecast. 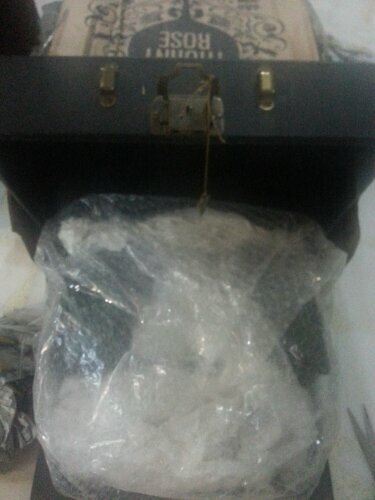 i anticipated for its safe arrival and reminded the seller again and again, and again to pack it well and even sent her a link on how to pack a typewriter. yet i still have to mutter the 2 dreaded words – OH NO!!! 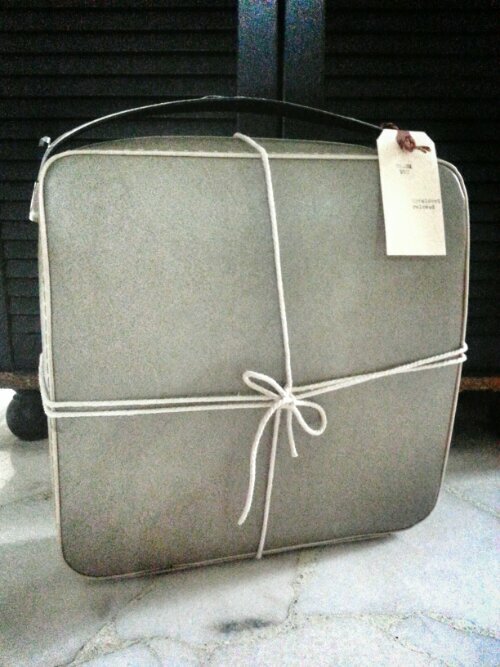 !…..when i opened the box. Inside it’s stuffed with some bubble wraps. here she is. the type slugs are dirty and clogged with ink. everything else operated and looked fine. she survived the treacherous trip. hurray!.. phew! i typed this and made my son signed it. haha.. (he loves the internet games too much, forgot he has to study and that there is another world outside the computer). 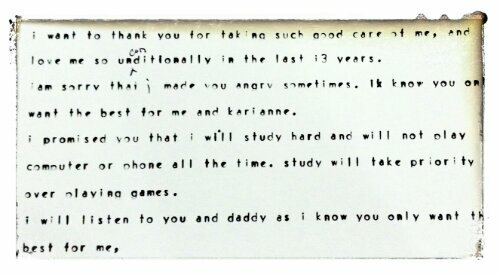 One more reason parents should have a typewriter at home? this contract cannot be edited or deleted. It is permanent and can be filed and retrieved anytime. the ‘i’ key was very sticky at first. now, less sticky with every depress. i thought this typeface is found only in royal p second model until recently. 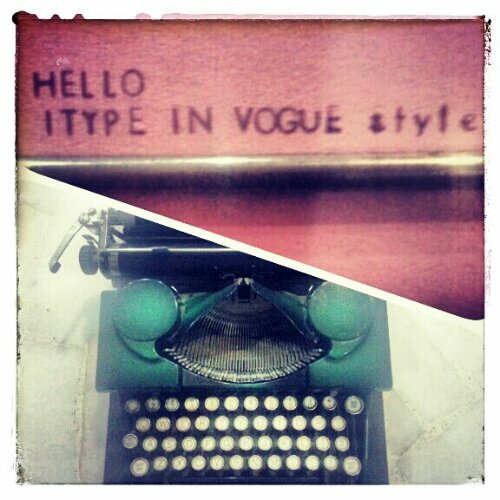 life in a typewriter blogged about one vogue typeface royal p first model here. now i want another with a maroon or red or blue or yellow body! thank you so much for dropping by and sharing my happiness (my family didnt understand why i was grinning from ear to ear). if this vogue is the coveted ‘v’ typeface, there is another rarer one. 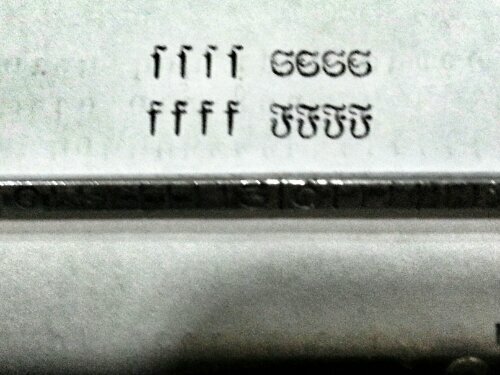 the ‘f’ typeface. do you know what is that word? i hope i can share with you ‘that’ happy story soon.